After winning the World Heavyweight Championship under the fatherly tutelage of Rocky Balboa (Sylvester Stallone), Adonis ‘Donny’ Creed (Michael B. Jordan) faces a new threat in the shape of Viktor (Romanian boxer Florian Munteanu), son of Ivan Drago – who thirty years ago killed Adonis’ father in the ring. Ryan Coogler’s Rocky revamp Creed surprised everyone in 2015 by being the best series entry since the first Rocky. Like the best films in the series, Creed was an underdog with everything to prove. But as craggy Italian Stallion asks Donny in this new instalment, when the underdog becomes the champ, where is there to go? It’s a problem that the original Rocky sequels always ran into, manufacturing reasons to get the eponymous back into the ring with increasingly silly dividends. Creed II‘s first act threatens to fall into the same trap, especially with the return of Rocky IV’s Ivan Drago (Dolph Lundgren), the most cartoonish of Rocky’s old nemeses. Director Steven Caple Jr. steps into Coogler’s shoes well, occupying the same gritty world but drawn on a larger, broader canvas. The soundtrack, employed so rousingly in Coogler’s entry, is not quite beat-perfect here, but visually the film fares better, with cinematographer Kramer Morgenthau crafting some lovely compositions. Using the negative space of a mirror, the film’s opening scene signals one character’s accession over another and there are some impressive underwater training sequences, hinting at Donny’s unresolved inner conflict. Meanwhile, the film finds new ways to keep the boxing fresh, visceral and brutal. 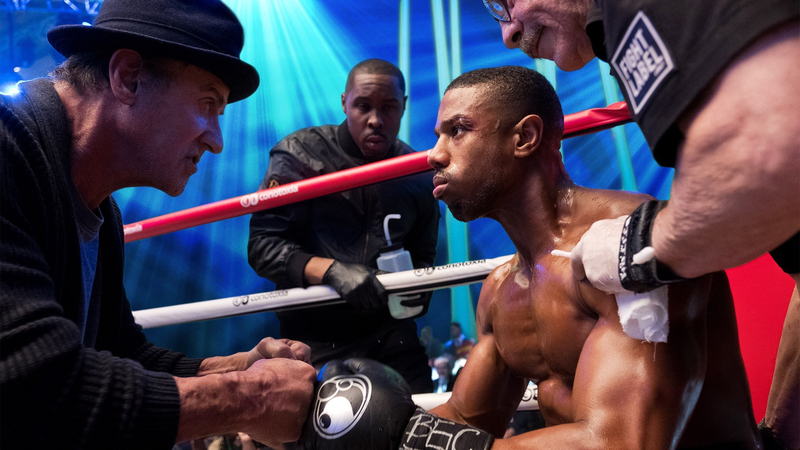 Creed II is neither as assured nor as rousing as its predecessor, but it has a secret weapon up its boxing gloves, and that is to embrace the daftest elements of the series while simultaneously finding the heart that drives every good Rocky film. The result is a surprisingly meditative affair about reconciling with the ghosts of the past. The film’s second act in particular slows the action in favour of family drama. Consequently, both Donny and Viktor must examine their personal motivations for fighting, interrogating the toxic macho discourses that routinely underpin the series. Indeed, one of the film’s best elements is Drago Jr. A towering goliath standing a ludicrous foot and a half above Donny, his effect is less the Soviet Terminator of his father and more a wounded puppy, driven not by nationalism but by the vulnerable need for approval and reconciliation with his father. When Donny loses his cool at their first weigh-in, Viktor doesn’t retaliate but instead glances fearfully at his father, unsure of how to react. Meanwhile, Donny must contend with his own motivations for boxing while pulling himself together enough to support fiancée Bianca (Tessa Thompson), whose music career has a finite lifespan due to her failing hearing. When it transpires that their new daughter may be deaf, the film deploys one of Rocky’s trademark speeches when he tells Creed to stop wallowing in self-pity, because his daughter sure as hell isn’t feeling sorry for herself. But unlike Stallone’s habitual bellowing, this is one of the film’s quietest, most powerful moments, a world away from boxing and macho posturing. Rocky has always lived and died on its direct, unsubtle sincerity. It’s in these heartfelt moments where Creed II flies, underpinning its thoughtful climax and one of the series’ most surprisingly moving endings.